It was about 1960. I was laying down in the back seat of our 1956 Chrysler New Yorker one winter night while we were driving back home from a visit over at my cousins house one Sunday. I used to like to lay back there, all by myself and cover up in my Dad’s army blanket to keep warm. It was a really dark and clear night, and I was gazing out of the rear window of the car at all the stars in the sky when what caught my eye was this glimmer of a group of stars all clustered together high in the sky. I could see 6 or seven little stars shimmering together. I thought that it was unusual to see such a clump of mysteriously looking stars and wondered why that was so. I told my Mom and Dad to look at that strange sight in the sky. I remember Mom saying that she never noticed them before and thought they were pretty too. Then there was another evening, a summer evening when my Dad and my Uncle told my cousins and I that there was going to be a satellite seen in the evening sky. When we went outside that evening, I tried to find that familiar cluster that I saw the previous winter night, but didn’t see them. I couldn’t understand why. Then that is when I thought that maybe these little points of light must move around and they moved apart. Then right about that time, my Dad, looking up very high in the western sky said,” Look, there it is, right in between those two stars! It’s moving thataway!” We all got excited and saw the satellite too! Yup, there it was, moving toward the east! Since then, I used to like looking at the stars whenever we would drive to or from somewhere at night! I was hooked in astronomy in 1962. 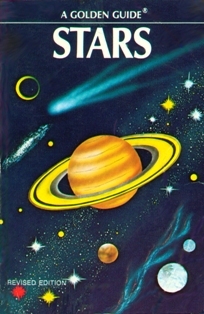 I remember picking up a book called "Stars" at the library in elementary school. I was fascinated with the idea that there were other worlds circling the Sun as our planet Earth did. I asked my parents for a telescope for Christmas of that year. 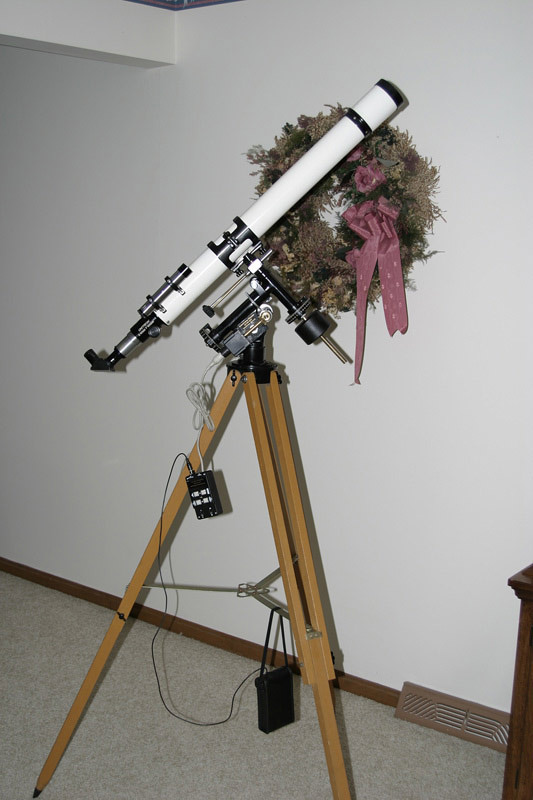 They did get me a Sears 2 inch terrestrial refractor on an altazimuth mount. I can remember the first time I looked at the Moon through the window only to find that it was blurry no matter how much I tried to focus it. Little did I know then at 9 years of age that the window is not optical glass. The following summer, I took the telescope out one evening to look at the Moon. When I focused it I was awed being able to see craters on it! 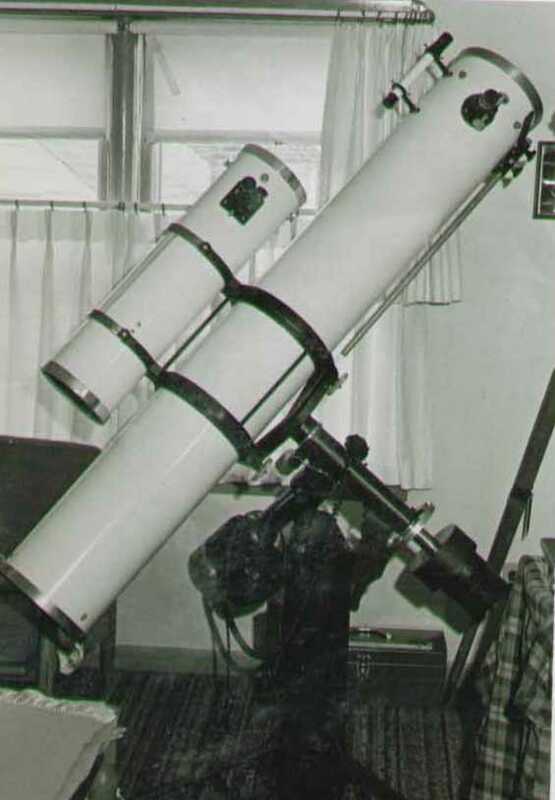 When I was 12, I got a a bigger and more powerful astronomical refracting telescope for Christmas. It was a Sears 3" f/16 refractor. It came in a wooden case, barlow lens and 5 eyepieces. 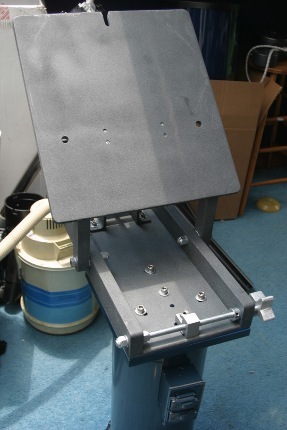 I learned about the equatorial mounting and how it worked. I was really hooked on astronomy when I saw Saturn for the first time! Those elusive rings created an impression that I don't think I will ever forget. I still use that telescope today along with a solar filter for observing and photographing the Sun. 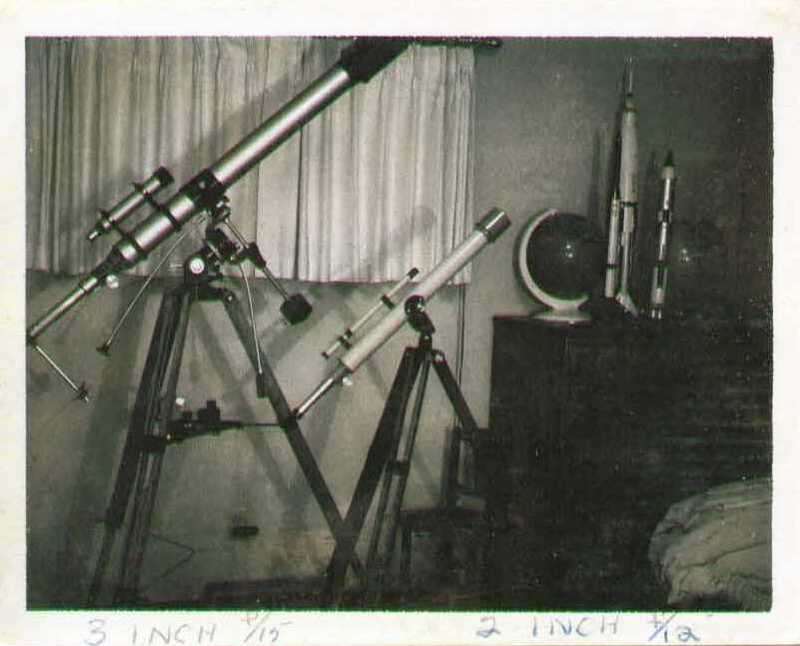 The 3 inch f/16 Sears Discoverer and 2" terrestrial refractors. Later in high school, one day in the library, I picked up a copy of the Sky & Telescope Magazine. It was the October 1968 issue. It was then that I began to get the bug for a much larger reflector like a 6 or 8 incher. The following summer, I did work for my cousin at Kastaway Kulis's Taxidermy Studio. I earned enough money that whole summer to buy individual parts for my 8 inch f/8 reflector with a Cave Optical Company heavy duty equatorial mount. Many a nights later and rolls of film developed, I learned how to take pictures of many things in the heavens. Some of which I have posted here on my web page. page. After I got married, my interest in the hobby waned considerably. Then after 22 years and 2 sons later, there was this one day, August 20,2003 to be precise, when we had this rolling blackout! That night was the most impressive sight we all experienced here in the Cleveland, Ohio area. It was actually a dark night and the full beauty of the Milky Way shown through! I was reborn into this hobby again!. Even though my interest in astronomy has waned for so many years, I still kept up with the latest with my Sky & Telescope magazine! I always wanted the Meade LX200 GPS telescope. So, I sold my 8 inch f/8 reflector, my 6 inch f/4 RFT and ended up buying a Meade telescope. I currently have the Meade 12" f/10 LX200GPS UHTC telescope. This is a Schmidt-Cassegrain design. 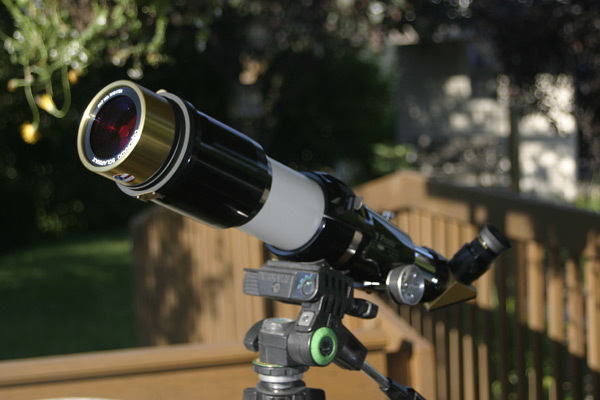 My Astrophoto's page is where I display all my images of the Sun, Moon, and the planets that I have captured using this telescope and a variety of cameras. Click on the Astrophoto's tab at the top of this page. As I mentioned above, I also use my 3 inch refractor for solar observing. The observatory was constructed in spring of 2004 to house my telescopes. 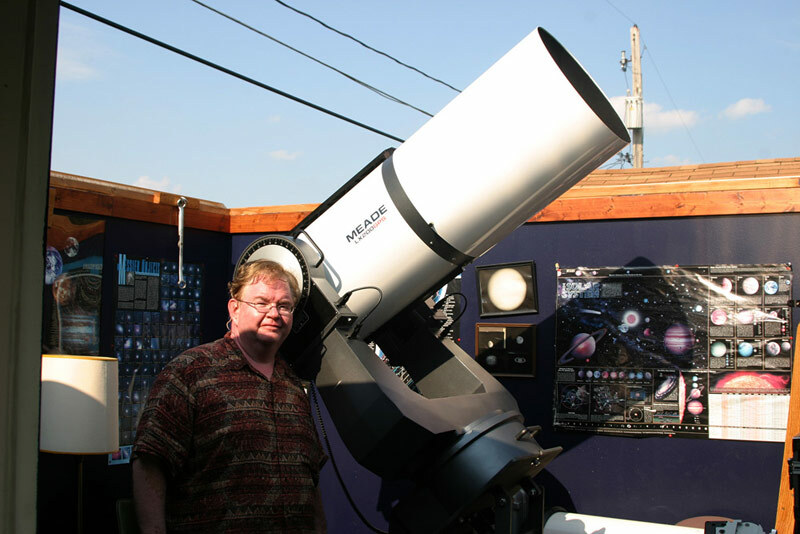 I have researched on the internet many types of styles and designs through an awesome website called Amateur Astronomical Observatories which is maintained by Bill Arnett. I settled for Scott Horstman's CJE1 11'6" x 11'6" observatory plan. He is headquartered out in Lodi, Ohio which is only about 45 miles southwest from where I live. 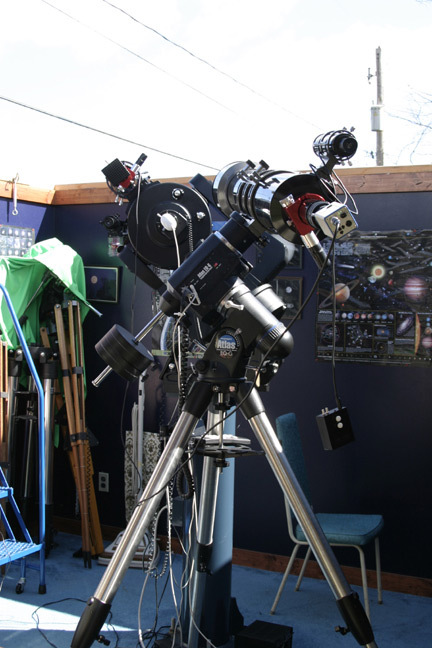 Check out his website "Backyard Observatories"; for more details. I am really glad I settled with his construction for he and his crew Don and Ryan did a superb job. Scott is also an avid amateur astronomer aside from his bread and butter career in carpentry, thus he knows the needs of the amateur with building a home for their telescope. The 8 inch reflector's last night out before it was sold. The Coronado SM60 Ha filter with the BF10 attached to the Televue Pronto 70mm refractor. 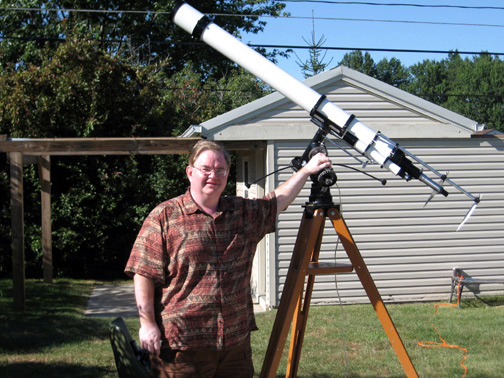 Here I am with my Unitron 4" f/15 Model 152 equatorial refractor. My latest bit of fun was restoring my 3" f/16 Sears refractor. Over the years it has been neglected, especially after I painted it white later in my teens since I always wanted a Unitron refractor. It was only until recently that I found out that these particular Sears refractors were of high quality. I do recall being able to easily resolve the star Epsilon Lyra, also known as the Double-Double star. Each one of the double stars are also a binary system. That is supposed to be a challenge for typical 3 inch refractors as a test to the quality of their optics. I first proceeded by removing all the parts, then stripping off the white paint from the telescope tube with a good paint stripper. Then using the wire brush on my bench grinder, I was able to remove a the rough spots and get the aluminum tube completely free of all the paint. Secondly, I patched up all the holes that I drilled into the tube from all the tube ring attachments that I added onto the scope during that era to add a guide telescope onto it. I used a good metal filler called JB Weld. This stuff works wonders on automobiles, so I figured that it would also be great for filling up the holes on the tube. It consists of two tubes, one a pasty metalized filler, and the other an epoxy hardener. It was amazing how hard this stuff gets. It had the consistency of hard metal after 24 hours. I filed the areas smooth with a metal rasp, and file then used sand paper to smoothen these areas. The next step was priming the tube with a couple coats of gray automotive primer. Then after a couple of days, I spray painted the tube with a metallic gray automotive lacquer which resembled the original tube somewhat. On top of that ewnt three coats of clear overcoat automotive lacquer to attain a very high gloss. The end result was a beautiful finish! The dew cap, finder rings, equatorial mount, and eyepiece holder all were originally a satin black or semi-gloss finish. I just applied new coats of paint on these areas after lightly sanding them to obtain a roughened dull surface for the paint to adhere to properly. Read more and see pictures of this restoration by clicking the Restoration tab on the top of this page. It wasn't long before I was told about CloudyNights website and Astromart. It was mainly the good friends that I met on the CloudyNights Forums where I learned and was brought up to date with the latest in technology and astronomical equipment. My array of equipment has swelled and my wallet shrunk!!! Today, I have all that is needed to really get involved in something serious as a contributor to the astronomical community. Below are some more pictures of the latest of my equipment. 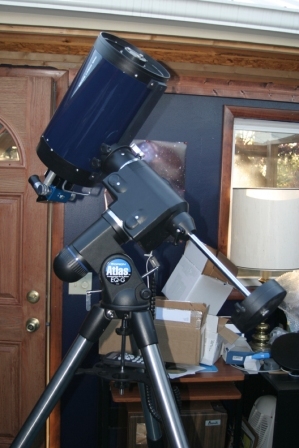 Just recently I acquired an Orion EQ-G equatorial mount for my 6 inch Apogee refractor. The Go-TO features on that mount plus the latest technology on it make it a pleasure to use for "grab-and-go" equipment. The 6" f/8 Apogee refractor on the Orion Atlas EQ-G GoTo mount. Behind that stands the 12" Meade LX200GPS on the pier. The 8" f/6.3 Meade SCT on the Orion Atlas EQ-G GoTo mount. It never ends!!! I buy and sell the equipment. This is fun to do. 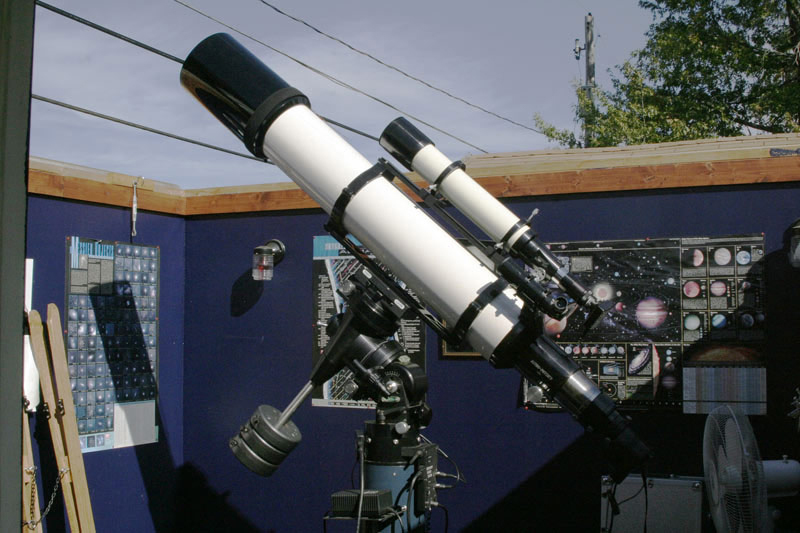 In 2006, I sold my Coronado SM60 filters, and purchased a very nice Coronado Maxscope 60 doublestacked solar telescope, a very nice Unitron 4 inch Model 142 refractor with a unique home built clock drive, a 3 inch Unitron/Polarex equatorial refractor for what us amateur astronomers refer to as a "grab-n-go" telescope. I had a different idea though. 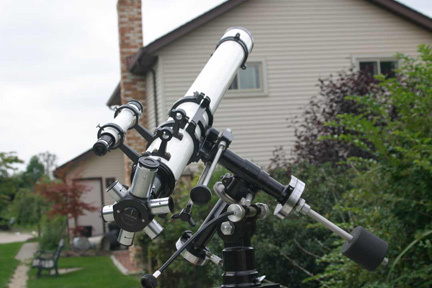 That particular equatorial mount is just perfect for my Coronado Solarmax telescope too. See below. 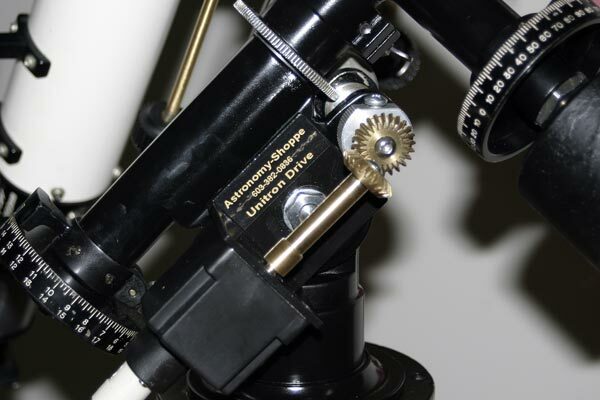 The 3" f/16 Unitron/Polarex refractor The Coronado Maxscope 60 DS mounted in the saddle of the 3" Unitron/Polarex mount. What a nice combo! 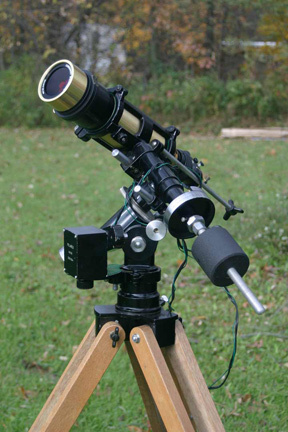 The 4" f/15 Unitron Model 152 refractor with a Unitron 2.4" f/15 refractor as a guide scope. Also note the homemade Unibalance assembly riding toward the top part of the 4 inch tube. I also acquired more Unitron equipment to restore and sell. Restoration work keeps me busy during the cloudy winter months. Below I restored a Model 128 to like new condition. On the picture at right is an aftermarket clock drive made by Astronomy-Shoppe that works very well with this setup. The owner makes them to fit all the equatorial mounted Unitrons as well as the Polarex refractors, whose vintage clock drives are very hard to find. Late in the fall of 2006, I decided to do a major revamp in my equipment. I sold my Atlas EQ-G equatorial mount, the LXD75 equatorial mount, the 8 inch SCT, and the 6 inch refractor. I purchased a Losmandy Titan equatorial mount, a Meade 14" LX200R. A good friend of mine owns a Meade ED178 f/9. I was impressed at the quality of the star images seen visually through that telescope. I thought this would be just the type of telescope to own to get into deep sky imaging. the turbulence in our atmosphere around the Great Lakes and the jet stream prohibit any worthwhile imaging of planetary detail. I was lucky if I had 3 nights in the whole year for doing that sort of imaging with the 14." 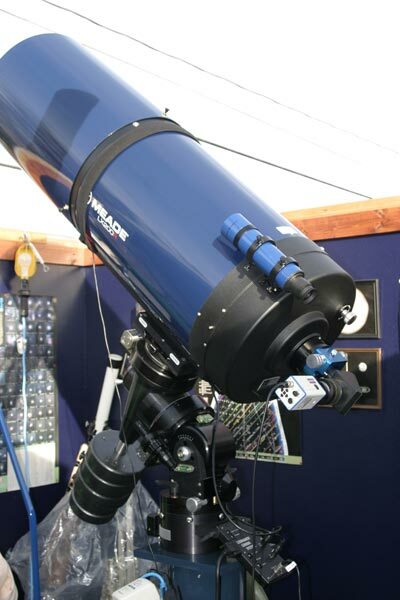 So in 2008, I sold the 14" Meade, and was fortunate to find a very nice premium meade ED178 telescope which was upgraded into a new tube, and the Meade lens assembly was retrofitted into the new cell and retractable dewcap done by APM Telescopes and also it has a Astro Physics 4 inch focuser! The previous owner had made this upgrade. This is the system I now work with. 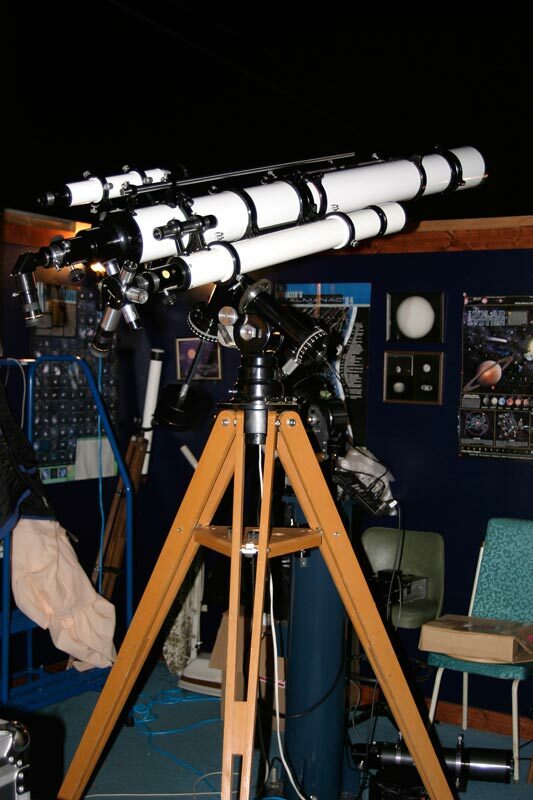 I had my Televue Genesis sdf mounted atop this telescope. I use a SBIG ST-2000XM mono camera with the CFW10 filter wheel, the AO-8 along with the Orion Deluxe OAG unit with the Meade DSI Pro as my guiding setup. Later I ended up purchasing the hih qualit MOAG. Wonderful off axis guiding equipment. I took many of the photos on the Deep Sky photos page here on my website. I had thought that this would have been my setup for a long time to come. My son Scott told me to make the move. It was a chance to own very large aperture! I did it! I sold the beloved Titan mount and the Meade 7 inch telescope and purchased the LX200GPS from my good friend Scott H.
Well when I got the Meade, was I in for a surprise. This thing is a real beast! The forks are massive. 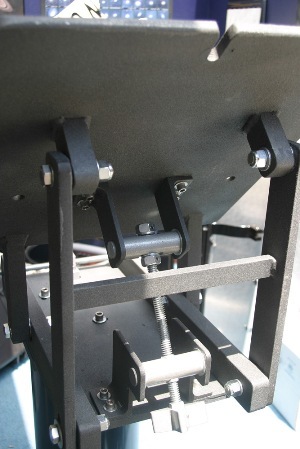 This mount is well made and supports this telescope very well. Both the R.A. and declination worm gears are 11 inches in diameter with 360 teeth. Talk about smooth and accurate tracking. This telescope is the best I ever had! I am looking forward to doing a lot of imaging with this rig. As for visual use, stunning is all I can say about this beast! M13 really comes alive with thousands of stars through a Televue Nagler eyepiece! Of course it goes without saying something about the wedge that my good friend Don made for this beast. It had to be able to hold up the whole assembly's polar axis at a 41⁰ North angle! This whole thing is made from 1/2 to 1 inch carbon steel. The LX200 sits on this without a flinch. 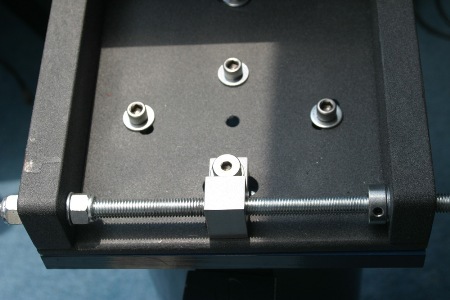 Notice the adjustments made to adjust azimuth as well as altitude of the whole assembly. All of the hardware on this wedge is stainless steel. Copyright © 2015 Len Marek's Astronomy Webpage. All rights reserved.